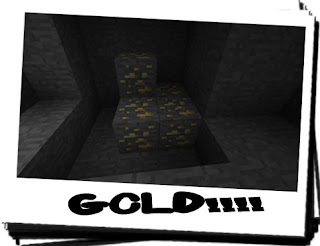 Diary of a Miner: Day 15: I HIT GOLD!!! I still can't make heads nor tails of that weird pig in my dream two nights ago... I didn't have that dream last night, just a regular, boring one where I felt like I was falling. For a change, Chiron woke me up by jumping on the bed and slobbering all over me! I suppose it was a good way what with it being slightly later than usual. I gave him his customary pork chop breakfast and I went to check on the farm; it's doing great. The reeds are shooting up, and the wheat is progressing steadily too! As i returned, I noticed a ton of feathers lying around near the base of the stairs that I hadn't spotted on my way down. It seems something or someone killed a few chickens during the night. Although whether it was another wolf or that weird shadow remains unknown. Probably for the best... Although I think I had seen another wolf around recently, and so it is likely to be the former. I then decided to take the minecart for a test; I set the steam cart to push the other cart down the main shaft and I raced off ahead, hopefully wanting it to work. 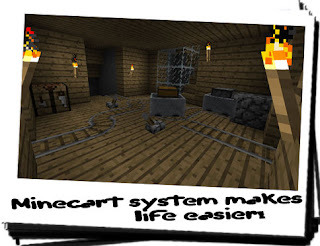 About a minute later along came the steam cart and the chest cart. They came down the track and collided with the breaker... a little too violently for my liking, but there was no damage done so I decided to leave it as it was. I then descended back into the main shaft and decided to go digging a bit more. I was hoping to find something really precious down here, what with it being rather deep. After about an hour of fruitless digging, I was tempted to break out another block of TNT, but I decided against it, especially as I had two other shafts to explore, and who knows how much further it'll last. My refrain was rewarded greatly though, about half an hour later! GOLD!!! I couldn't believe it: I'd actually struck gold! There was quite a bit of it too, I was ecstatic! After harvesting it, I returned to the entrance and placed it into the chest cart and sent it to the surface, being pushed by the steam cart. Hoping that there would be more, I returned to the spot where I had found it and continued digging. After another hour or so of digging around in the general area, I still had found nothing else. It had now gotten to the stage where I had begun finding coal veins, and I was leaving them in hopes I'd find something better to use my pickaxe on! It wasn't long after that when I found something I had never seen before; I had just got through a rather stubborn patch of gravel when I saw a glint of blueish light. My heart skipped a beat; had I found diamond? 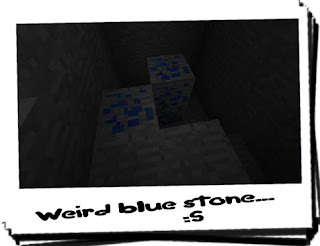 After digging awhile longer I had excavated the strange find, only to be confronted with a strange blue stone. After excavating, I noticed the rock was actually made up of smaller blue stones which broke up in my hand when enough pressure was applied. I'd never seen this before, not even in the MiNES! Maybe it was a new form of gem or ore which could be used as an alternative energy source. Maybe I'd found the solution to the world's energy crisis! All I saw though was a handful of blue stones and powder. In any case, I collected it up and put it into my inventory, and returned to the surface. 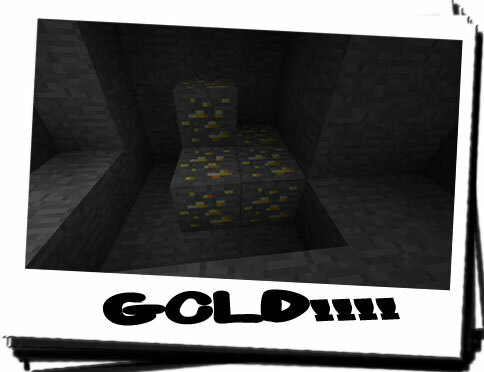 On the way up I noticed the chest cart had successfully made it back to the surface and the gold was intact. I had no use for actual gold, due to its softness, so it was terrible for armour, weaponary and tools. I decided to smelt it anyway into bars so it was easier to transport, and placed them into the same chest I had put the extra iron. This would be my bonus chest! When I returned to the house from the cellar, I hadn't realised how long I'd been down there; the sun had already begun to go down and Chiron was sitting in front of the cellar hole expectantly. I think I might try another bit of fishing again later, or maybe try a bit of late night work flattening the area near the forge: I have grand ideas for a huge forest there at some point, I'm just waiting for me to use up the current stockpile of wood already there... That's a point, I could go and chop some wood! It'd be a good excuse to check on the water trap.